Anyway, I think the key to a great Valentine’s Day is to focus your attention on the people that you love! Yes, chocolate and teddy bears can definitely elicit a genuine, “Awww,” from your sweetheart, but I think this somewhat cheesy holiday can go deeper. For me, Valentine’s Day is about being with the people I love and showing them how much they mean to me. Sometimes, that means going the extra mile to plan something special. Or, it can mean just saying or doing a few little things that can make someone’s day. While I am no love expert, I do have a knack for cooking meals that make people happy because it was made just for them! Cooking a special meal does not require a lot of time or money. It just takes some a little sugar n’ spice, and maybe an easy recipe to get you started. So, if you’re scrambling this afternoon to whip up something spectacular for that special someone or those amazing people in your life, you can get off of Pinterest, already! 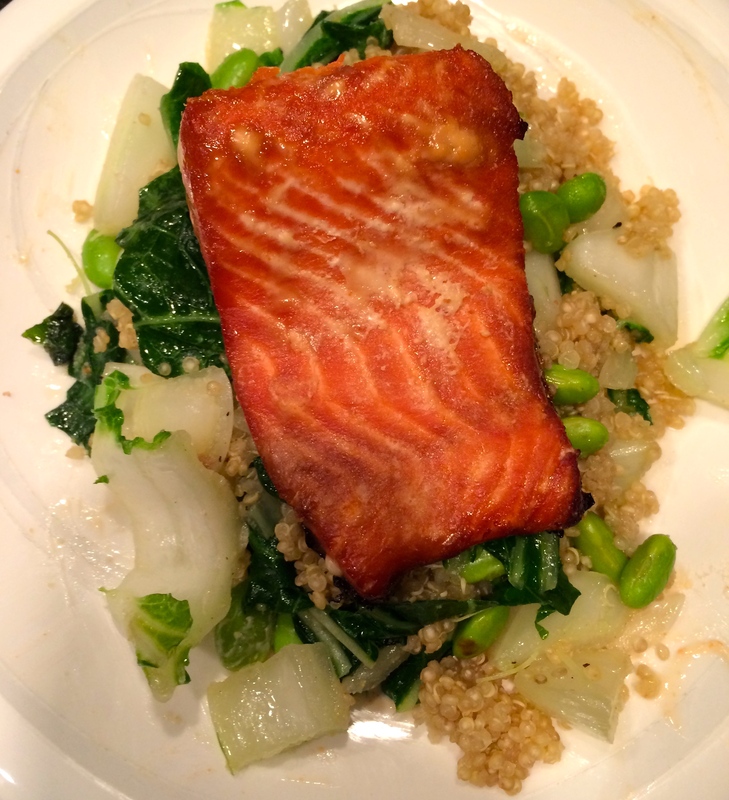 My Soy Salmon with flavorful quinoa is so easy, and tastes like you spent hours and hours on it. And even if you say you can’t cook, follow my step-by-step directions, and you’ll be just fine! It’ll be a Valentine’s miracle! Just remember: Even if things don’t go perfectly today, keep in mind the fact that you took some time to make someone feel loved. 2. In a gallon size Ziploc bag or large bowl, pour marinade over salmon filets. Marinate for at least 20 minutes to overnight. 3. Coat a baking dish with cooking spray, and add your marinated salmon, skin side down. Pop it in the oven for about 15-20 minutes until cooked as desired. 4. Add quinoa and broth or water to a pot. Bring to a boil, and then simmer for an additional 15-20 minutes until liquid is absorbed. 5. While the quinoa is cooking, sautée onions, bok choy stems, and frozen edamame. After several minutes, add bok choy leaves. Add to cooked quinoa, along with soy sauce or sesame oil. Mix thoroughly. Voilà! Valentine’s Day dinner is served! Yum! Already have tonight’s menu planned and started, but I’m looking forward to trying this later in the week! I hope you have an excellent meal tonight. Let me know how you like the salmon when you make it! Thank you for the nice comment! Happy Valentine’s Day!